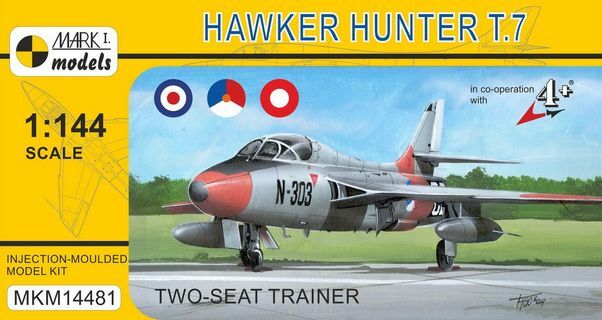 The Hawker Hunter was a British jet fighter developed during the late 1940s and its prototype, the P.1067, was flown in July 1951. Succeeding first-generation jet fighters such as the Meteor and Venom, the first Hunters were introduced to RAF service in 1954. The Hunter T Mk.7 was a two-seat trainer variant built for the RAF. It had the single seat nose replaced by a side-by-side seating section. Originally based on the F Mk.4 fighter, six aeroplanes were rebuilt and 65 were built new (incl. 10 a/c for the Royal Navy as T Mk.8s); the first T Mk.7s entered service in 1958. The Netherlands bought 20 T Mk.7 aircraft, half of which were later sold to other countries, including Denmark. It was a two-seat swept wing all-metal monoplane aircraft powered by a R-R Avon turbojet. It featured two wing-root intakes, single jet pipe, upward-opened canopy, ejection seats and tail-mounted brake parachute. The on-board armament of the two-seat Hunter was reduced to one (or two) Aden cannon semi-buried in the fuselage undersurface, while up to four drop tanks could be carried beneath the wings. The Hunter was one of the RAF's mainstays from the mid-1950s through the sixties. It became a popular machine in foreign service, being exported to many countries worldwide. Two-seat variants remained in use for training and secondary roles with the RAF and the Royal Navy until the early 1990s. This injection-moulded kit contains 34 parts (moulded in grey plastic) and one clear part (the cockpit canopy). A comprehensive instruction leaflet and a decal sheet are included.